Baja California is one of the great surf-and-turf states of northern Mexico, renowned for its unique carne asada; in Mexicali, there's more of a Sonoran influence, and in Tijuana where an original style with a southern touch has spread down the peninsula all the way to Cabo, and has now moved north of the border all the way to LA. In the late '50's, Don Guadalupe Zarate began to make carne asada tacos in corn tortillas–the preferred choice of Puebla–using only skilled taqueros from the state of Puebla preparing a blend of thin, local cuts of beef that were chopped into small rectangular bits. In 1968, this street cart operation moved into a permanent spot at Las Ahumaderas, a once popular row of taco stands that has seen better days. 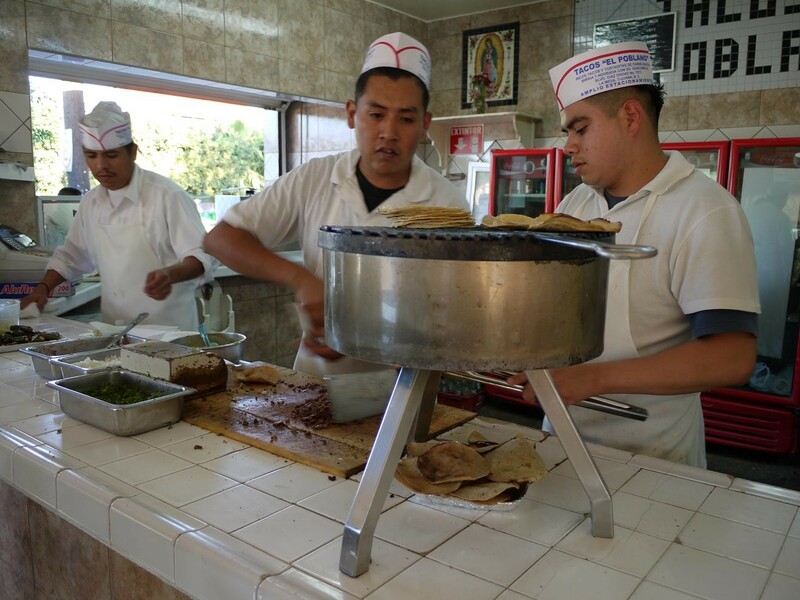 In 1974, Don Reynaldo and Don Sebastian Rodriguez opened there formal taqueria in Otay Mesa, where a name was finally given to honor the taqueros that had forged this delicious carne asada tradition: El Poblano. 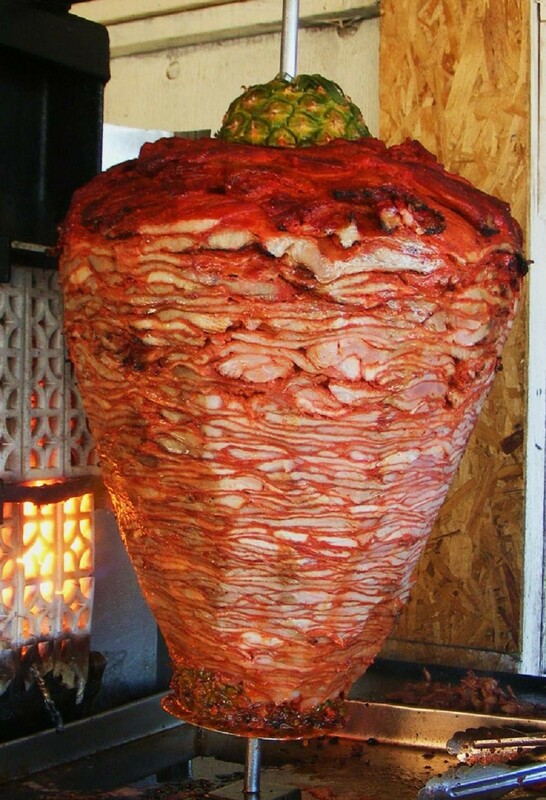 Now, I know what you're saying–“but there's no carne asada in Puebla, is there?” No there isn't, but there is one of the best al pastor practices in Mexico, and that came with the Poblanos, called by its regional name in Baja: adobada. Besides the adobada, the only real thing that's Pueblan about these carne asada tacos is the highly-skilled taqueros themselves. They mostly come from the city of Izucar de Matamoros, Puebla, and the surrounding communities; professional taqueros that have been lured to Baja California, Baja California Sur, Chula Vista, and all the way up to the streets of South Los Angeles by sheer demand for their tasty craft. The tacos are unmistakable–a savory blend of chopped beef cooked on mesquite is served on a corn tortilla, then topped with onions, cilantro, a tomato based salsa, and a spread of creamy guacamole that's practically pure avocado spooned on by a poblano in rapid fire fashion. The final touch is a conical wrapped taco held together by a small square of butcher paper–this is a dead giveaway that you've come across Tijuana-style carne asada, the Pueblan way. 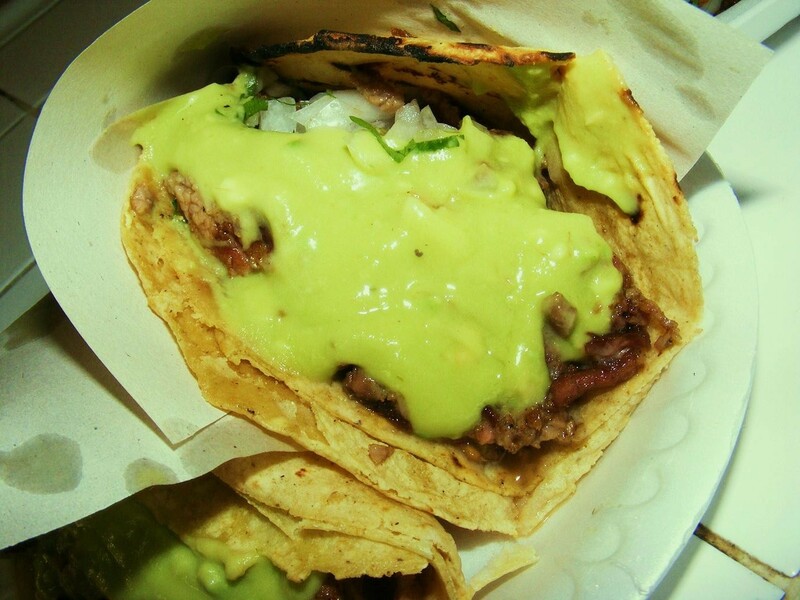 Whether they are called El Poblano–which is a small chain in Tijuana with an outpost in Chula Vista–Los Poblanos, Los Poblanitos,etc., you can count on the same style of carne asada from the full-blown taquerias down to the streamlined stands. 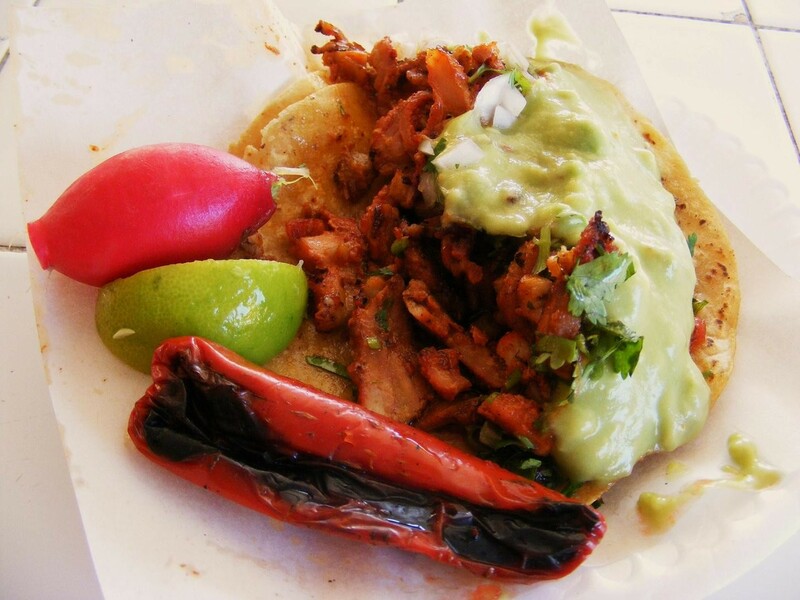 While a team usually handles the grill steak detail, a lone taquero mans the trompo loaded with crimson adobada torched by hissing flames, but in Tijuana and Baja, creamy avocado takes the place of pineapple, with adds a lighter sweetness. Normally you order from the adobada guys separately. When their spit roasted pork is need for menu specials like a mulita, a type of taco sandwich. A few summers back I made the 17-hour breathtaking, cow-dodging trek down to Loreto with some friends and came across a pair of taqueros also calling themselves El Poblano(not affiliated with the Tijuana chain) when I realized that this was a peninsular phenomena. The hard working young man on the adobada spit said, we're practically all from the same town, ” casi todos somos paisanos.” They said that their brethren had spread the Pueblan-style Tijuana carne asada from Cabo San Lucas all the way up to the city of origin: Tijuana. ANd unbeknownst to them, I came across a half dozen poblano vendors from Tijuana preparing this unique taco tradition in South Los Angeles. There is no carne asada in Puebla, but there is one of the best al pastor scenes in Mexico which explains the excellent marinated pork that flies out of these taco stands. 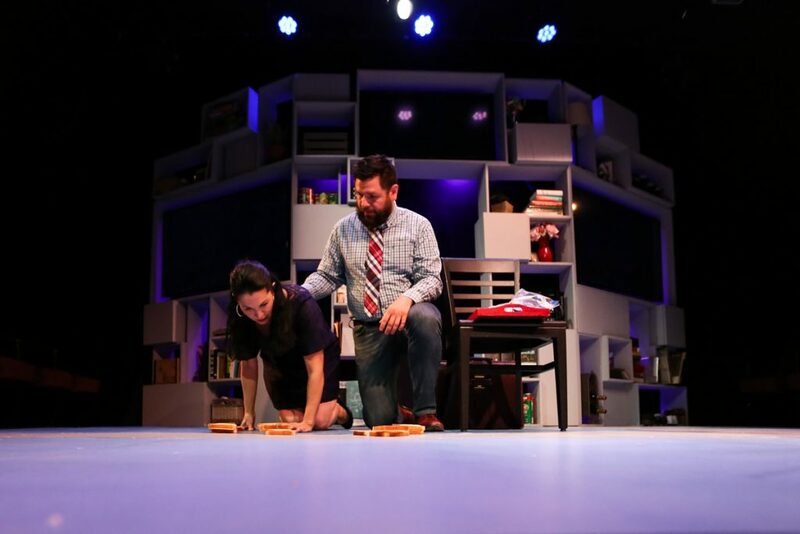 One taquero joked, ” if we opened one of these in Puebla, it would have to be called Tijuana style tacos, because we don't have this [carne asada] down there.” It's really the mercenary chops these taqueros bring to the chopping block. Baja Californios can find the Pueblan fashioned carne asada in both Baja California and Baja California Sur, and in just about every city–one recently opened in the Valle de Guadalupe. The steak tacos are out of this world–savory beef cooled by an icing of guacamole, and formidable adobada given the same sweet, green spread of luscious fruit. From South Los Angeles to Tijuana to Cabo San Lucas, you can trust in the poblanos, a band of hermanos that have helped define a Tijuana style of carne asada. 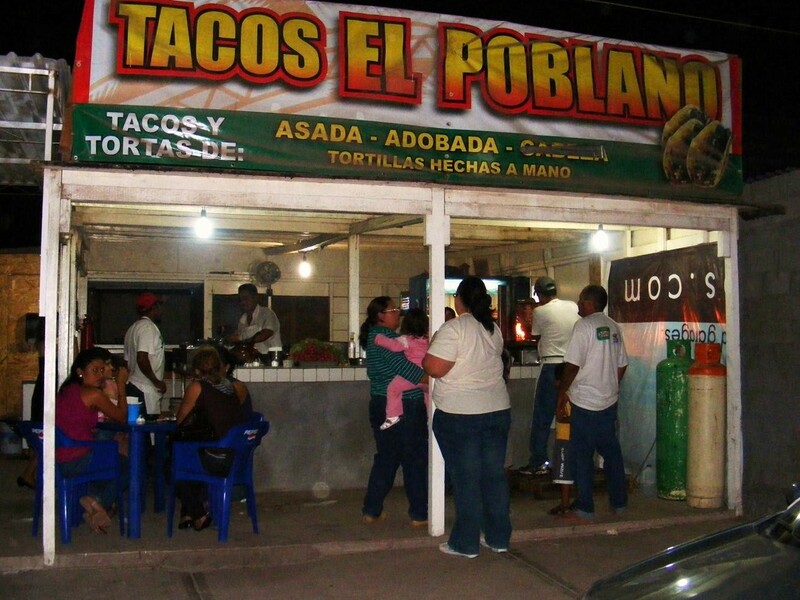 Tacos El Poblano, 7813 Bl. 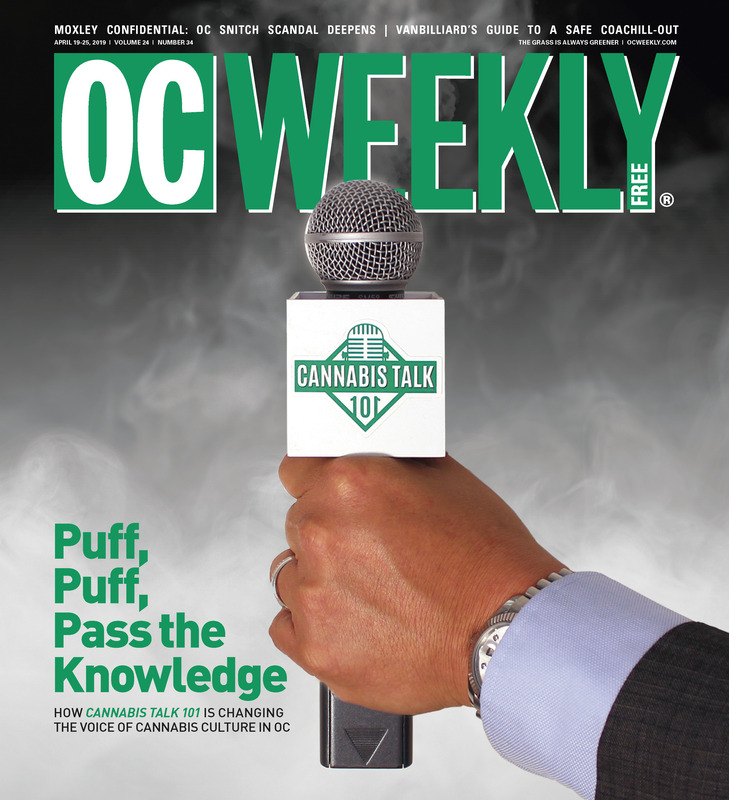 Diaz Ordaz, Tijuana, B.C., 7 days a week, from 6pm-2am, 6pm-4am on weekends, some other locations in Tijuana, and one branch in Chula Vista. 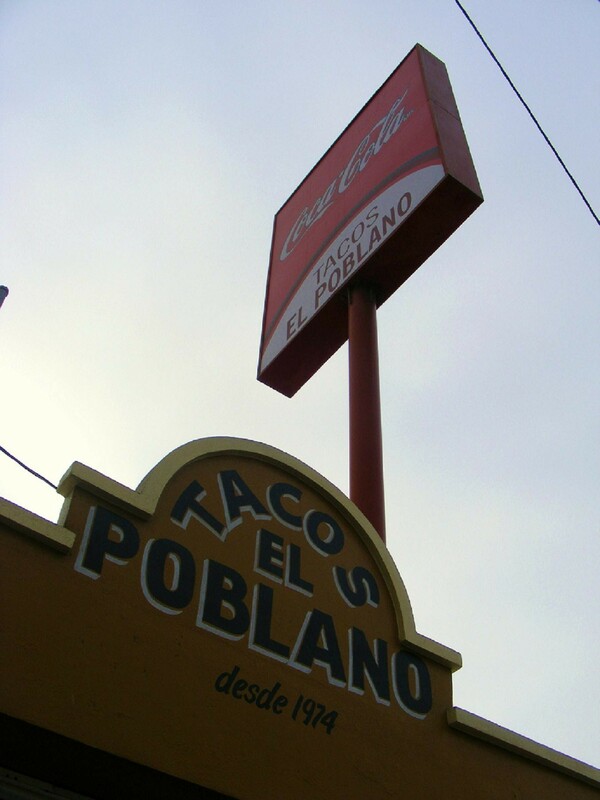 Los Poblanos, Los Poblanitos, and other such named Pueblan establishments doing Tijuana-style carne asada can be found from as far noth of the border as South Los Angeles, and from Tijuana all the way down to the bottom of the Baja peninsula.